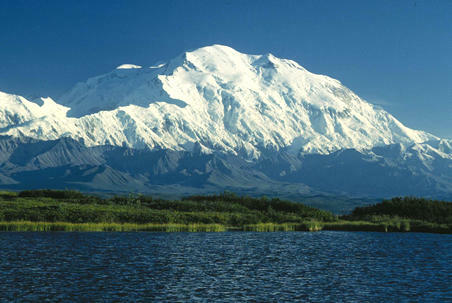 The highest peak in the picture above is Mt. 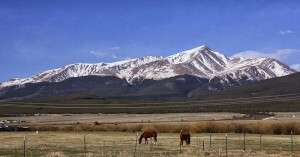 Elbert, located in the San Isablel National Forest, in Lake County, Colorado. 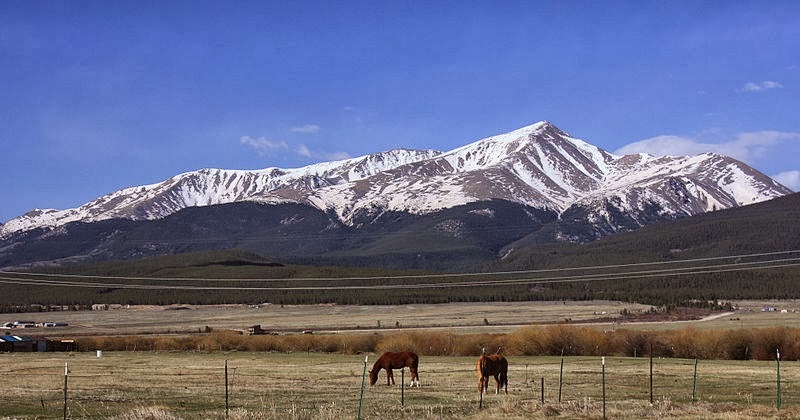 Rising to 14,433 feet above sea level, it is the highest peak in the Rocky Mountains, the 2nd highest peak in the 48 contiguous United States (after Mt. Whitney in California, which is less than 100 feet higher), and the 14th highest peak overall in the United States. Obviously, it is also the highpoint of the State of Colorado. 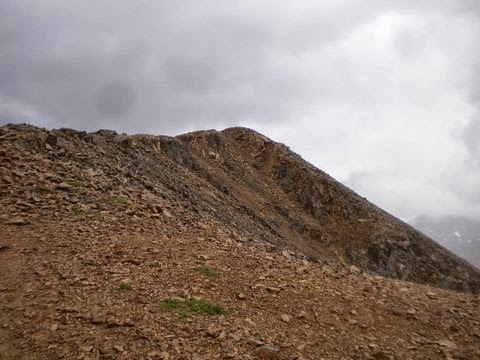 Hiking to it’s summit, although very strenuous, and involving a minimum 4,000 foot elevation gain, does not require any special mountaineering or rock climbing skills. Reaching the summit also happens to be a virtual cache on our website, Mt. Elbert Summit, and is our latest Sporadically featured OCNA cache on the blog. We were very happy that we were able to contact the cache owner, kingbee, and the only two finders to date, kejdad and tripman1. Kingbee joined our website a little over a month after it was launched, and Mt. 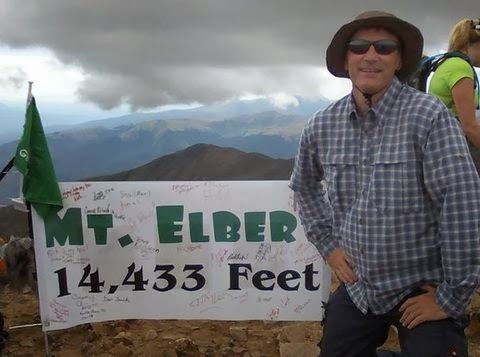 Elbert Summit is the 312th cache listed on our site. 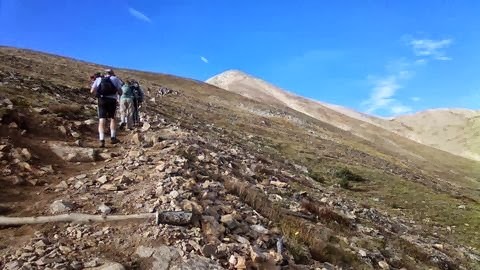 When asked why he made it a Virtual Cache on our website, said because “I enjoy climbing and hiking the mountains in Colorado, Most of the time it is so peaceful, quiet and serene”. 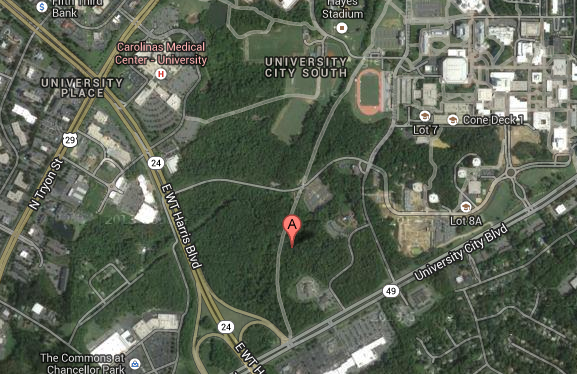 You’ll notice on the cache page, Kingbee gives the location (but not coordinates) of 3 starting points for the hike. One of them listed as 2WD access, two others as 4WD access. 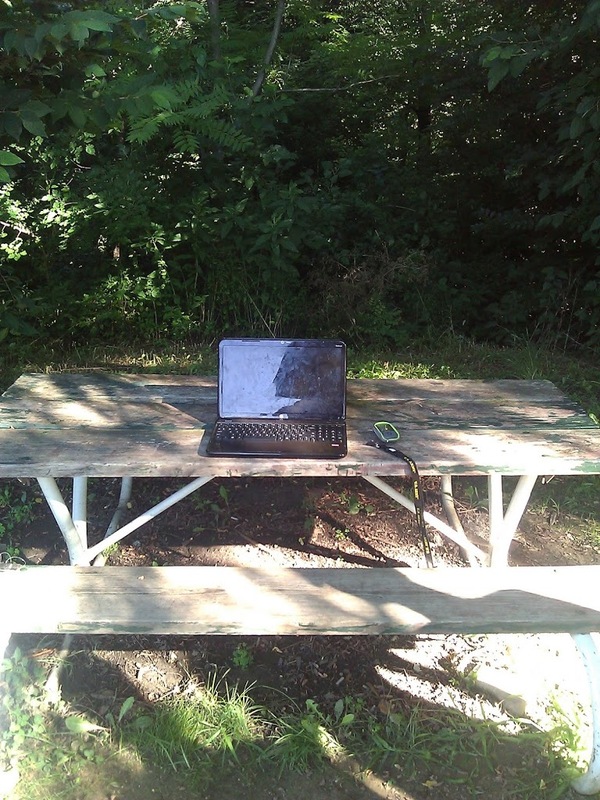 Tripman1 was the latest to try to summit the peak, at least as an OCNA member logging the virtual cache! 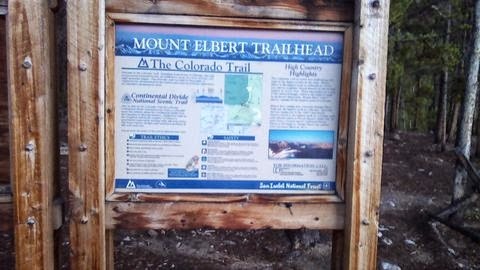 He made his attempt on August 31st, 2013, starting from the Colorado Trail trailhead, as shown. According to Wikipedia, this route is a 4,100 foot elevation gain. He was more than happy to share the details of his experience with us. 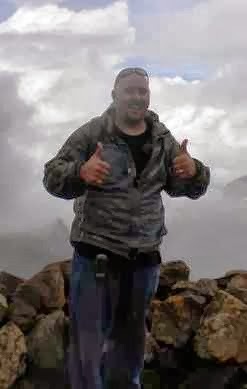 “I have enjoyed being able to chose geocaches from several websites and the opportunity to grab two different caches on one difficult climb presented itself over the Labor Day weekend. 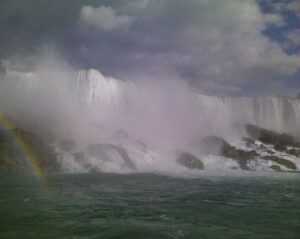 I had my eye on Mt. Elbert’s Summit (OOU0138) for a while, and another climber was finishing his ascent of all 54 peaks with the Mt. 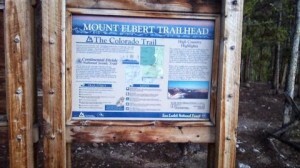 Elbert Climb, so I used this as motivation”. He went on to add: “The climb took about 3.5 hours up and 2.5 hours down. At the halfway point around 11,500 feet you pass the treeline and climb the rest of the way on bare rock. I was happy to have remembered sunscreen here. 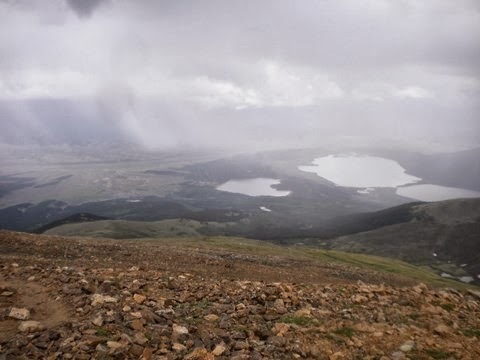 Since this was a holiday weekend there were many other hikers on the trail and if you did happen to run into trouble, you would have plenty of help. It was just a matter of pace and eventually I was on the summit. There were about 100 to 125 climbers on the summit to celebrate the accomplishments of the climber who had climbed all 54 peaks. The banner in the background commemorates the event and if you look closely you can see all the signatures of the participants. The view from the top is amazing and I really appreciate kingbee placing a virtual here and helping motivate my climb to the top”. Kejdad has also made a couple Colorado Mountain Summits into Virtual Caches on our website. 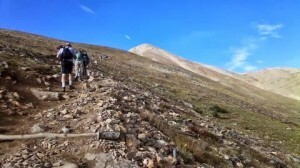 Another of the 54 “Fourteeners” in Colorado (Mountains with an elevation exceeding 14,000 feet), Mt. Bierstadt, is featured as our OU059D. 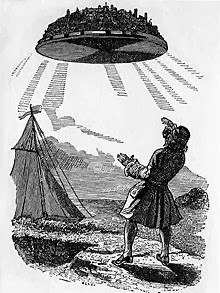 Additionally, he has made summiting 12,618 foot Lone Cone, in the Southwest corner of the State, a Virtual, our OU01F4. As mentioned in the last post, the Blogger recently went on a little Road Trip to the great State of Ohio, where he attended Midwest Geobash 2013 in Wauseon, Ohio. That was not the focus of his trip, however, and he spent only about 2.5 hours at the event, and most of that finding caches and capturing Munzees. Zero of which, for either game I might add, were very challenging! After the event, the Blogger, and his two traveling companions (his 13 yr. old son and 14 yr. old nephew), headed 3 hours south to the greater Dayton, Ohio area, for a two day stay at Wright-Patterson Air Force Base, where he hoped to find some of the 16 Opencaching.us listings in the greater Dayton area, with a focus on Ohio’s First Dead Drop!! !, the sporadically featured cache. 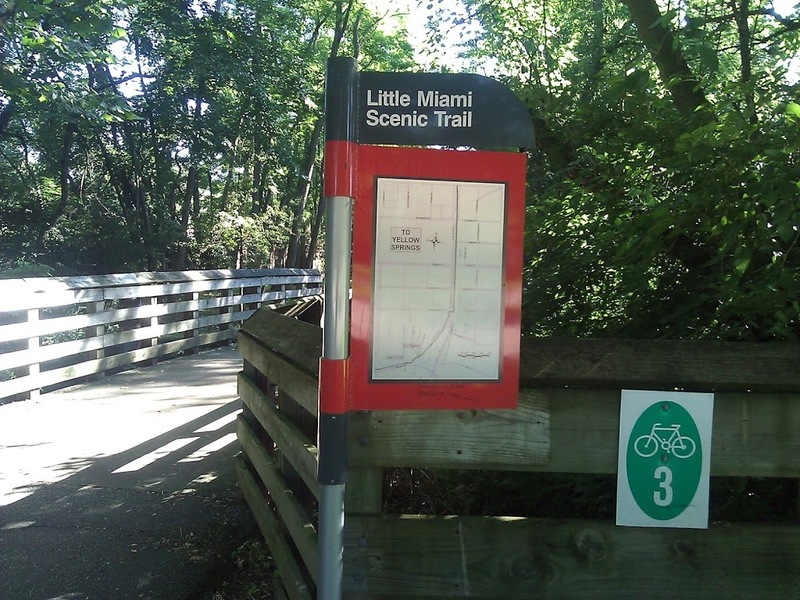 The Dead Drop Cache is located in The City of Xenia, Ohio (ZeeNeeUh), 12 miles SE of Downtown Dayton, and very near Xenia Station (pictured in the paragraph above), a hub for five bike trails. 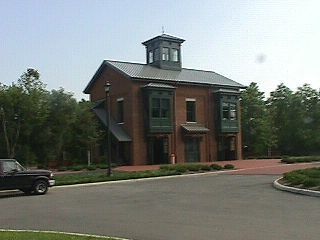 The building is a replica of the City’s 1880’s Rail Station, not original, but is very nice, and has a lookout tower you can visit. Shown to the right is one of the five trails, The Little Miami Scenic Trail, with a bridge over Shawnee Creek. The City of Xenia touts itself as “The Bicycle Capital of the Midwest”. The slogan is even on one of the water towers in town, which I later visited for an Opencaching.us listed cache. You can read about the five trails on the Xenia Station wikipedia page. Some of you may have read this far, and are still wondering “what the heck is a Dead Drop?” They are probably more commonly known as a USB Dead Drop, and they are computer USB Flash Drives hidden (sometimes in plain site) in public. We at OpenCaching North America have only adapted the concept to Geocaching; the world-wide peer to peer file sharing network was invented by German Media Artist Aram Bartholl in October, 2010, and he maintains the official website. The concept of public USB Dead Drops is not without controversy though; anyone can intentionally or unintentionally infect the flash drive with Malware such as a trojan horse or keylogger, for example. The flash drive itself could become corroded from the elements, and short out your USB port. 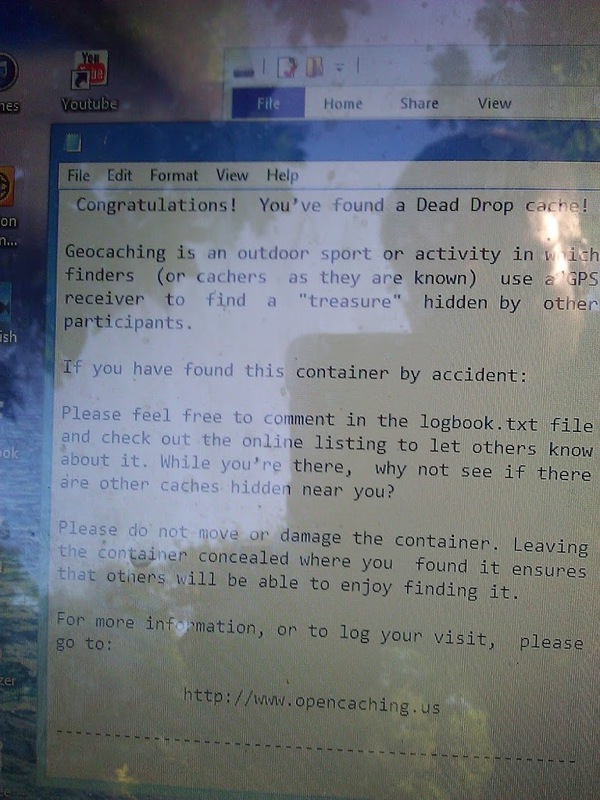 We at OCNA feel our Dead Drop caches are much safer then the public Dead Drops, at least from the standpoint of receiving Viruses or Malware, as the drive will typically only contain two text files, a “readme” file, and the log. This is outlined in the article on that cache type in our OC Wiki. Ohio’s First Dead Drop!!! was placed on September 1st, 2012 by username Bernoulli on our website (Bernoulli and family on Geocaching.com). We asked him how he first heard about our website, and what he liked about it. Of course he couldn’t remember exactly where and how he heard about it, but he had a lot to say about what he likes about the unique cache types available on our website: “I spend a lot of time outdoors in the woods and on the rivers but I also have a young family who is into everything so I get busy and can usually just work it in when I can. That’s where virtuals and other cache types come in – I love taking the family to interesting places that others should see but I can’t always place a physical cache there because of restrictions, as there should be. Both the Hocking Hills Region of Ohio as well as the Red River Gorge of Kentucky fall into that category and Earth Caches are OK but it’s hard to get confirmation that someone was there. You can’t require a photo anymore with EC’s and there is no option for some sort of required code to prove you were there. With the “numbers mentality” of many cachers, it wouldn’t be too hard to fudge a log to some of those EC’s and I hate having to delete logs. With OCUS virtuals, I can require a picture and a confirmation code that can only come from being there. Caching is about the journey anyway, so virtuals make perfect sense”. We agree! 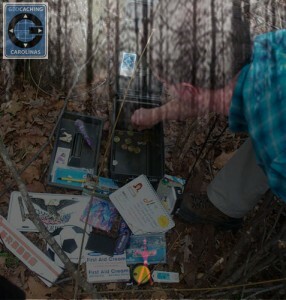 Did you know that about 97% of Geocaching.com accounts were created after they stopped accepting virtual caches? 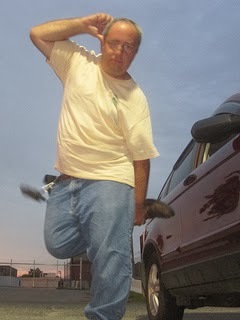 We are happy to allow this cache type, and, contrary to popular belief, we rarely, if ever, receive any “lame ones”. 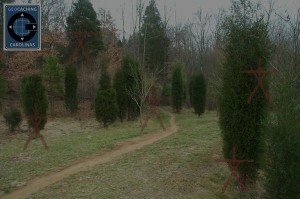 Well, the Blogger and his traveling companions arrived on site at Xenia Station, and found the cache relatively quickly. We would say we consulted the hint, but the “hint” was pretty much on the cache page in plain text. We did sort of need it, the USB Flash Drive was extremely well-hidden to the casual passer-by, and we did have some difficulty locating it before consulting the cache page on the GPS! On the left, you see the Blogger’s find log on the computer screen. Complete with a reflection of him taking the picture of it, in the 9:30 or so AM sun. It almost looks like it’s supposed to be the background image on the computer, doesn’t it? P.S., ignore the fact that he forgot to date it. :-). An excellent cache, in an excellent location, near the hub of five bike trails. 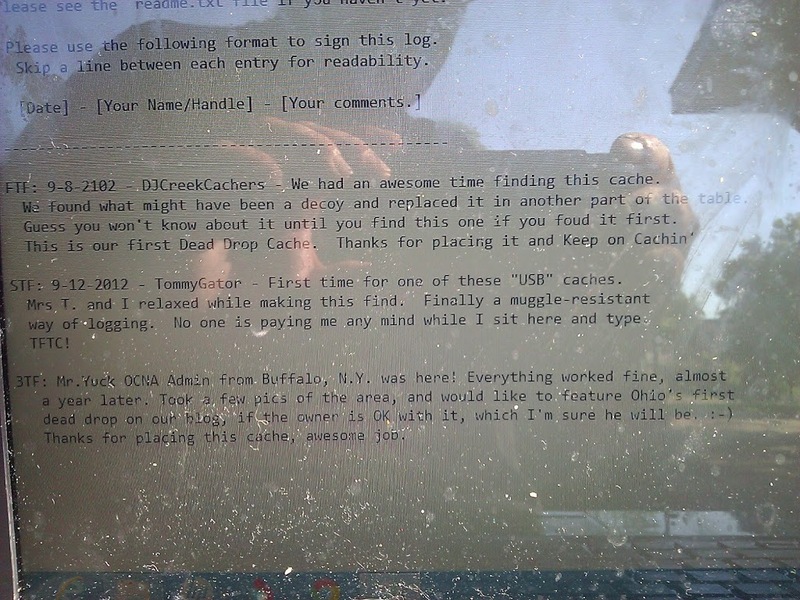 And a unique cache type, which is only available on Opencaching North America. How could you possibly go wrong here? Thanks to Bernoulli for placing the cache, and congratulations for being the second Sporadically featured OpenCachingNA Cache on the Blog.